This model is available in SysCAD 9.3 Build 137 or later. The Simple Condenser is a generic "heat exchanger" model without regards to its cooling media or equipment size. It can provide estimates of the Duty required to condense an amount of material, or alternatively, determine the amount of condensation for a given duty or temperature. The diagram shows the default drawing of the Simple Condenser, with all the possible connecting streams. The physical location of the connections is not important; the user may connect the streams to any position on the drawing. Feed Required In 1 10 Input stream to Simple Condenser. Product Required Out 1 1 Output stream from Simple Condenser. If Vent is not present, then this will contain the condensate, non-condensed vapours and any non-condensable gases. Vent Optional Out 0 1 Venting of gases from Simple Condenser. This may contain both non-condensed vapours and non-condensable gases. So basically, the unit will be 'bypassed' without the user having to change any connections. This model is used for simple condensation, where the cooling media is not simulated but the energy from condensation is removed to keep the contents at the saturation temperature. The saturation temperature of the condensing species is based its partial pressure in the mixture, not the total pressure of the mixture. The Simple Condenser can be configured as part of the flash train, where the steam feed to the unit can be demanded from another unit such as a flash tank based on the duty requirements. Fixed Duty or Duty Tag - All of the condensing species in the feed will be fully condensed, if sufficient duty is available. The duty methods can be configured as part of the flash train, where the steam demand can be calculated and passed on to the upstream equipment based on the required duty. Depending on the duty specified, the condensing species may be cooled, fully or partially condensed, and subcooled. Product Temperature - The user specifies the desired outlet temperature. If it is above the saturation temperature, then no condensation will occur. If it is at or below the saturation temperature, then all of the condensing species will be condensed. Saturated Temperature - The feed is heated or cooled to the saturation temperature with no condensation occurring. Condense All - All of the condensing species in the feed will be fully condensed. Please see assumption/limitation 4 below regarding non-condensables. Mass Condensed or Mass Condensed Tag - The maximum amount (mass flow) to be condensed is specified by the user or set equal to a tag. Fraction Condensed - The user can specify the fraction of the condensing species to be condensed. Bypass to Vent - Only available if a vent is connected and only relevant if feed contains some non-condensable gases. This method allows the user to specify a relative humidity in the vent stream. A fraction of the feed will be bypassed to the vent to achieve this. The remaining condensing species will be fully condensed. All non-condensables (both those bypassed and those not bypassed) will go to the vent. The condenser unit will condense the contents to the saturation temperature based on the partial pressure, so inlet pressure and entry pressure loss of the feed is important and the user should make sure the pressure is set correctly. The pressure of the unit will be set at the Lowest Pressure of all the feed streams less the Entry Pressure Loss. The simple condenser can condense ONE single component (species) only. It cannot handle multi-component condensation. All feeds of the condensing species may be condensed. The amount of condensation depends on the method chosen and parameters set by the user. If the vapour enters the unit above the saturation temperature, it will have to be cooled to the saturation temperature before being condensed. With most methods, the condensate leaves the unit at the saturation temperature, i.e. there is no further cooling of the liquid. If one of the Duty methods is used and enough duty is supplied to condense all the condensing species, then subcooling of the liquid can occur, up to the maximum subcooling temperature limit. 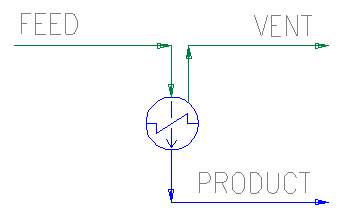 If non-condensables are present in the feed, and the Vent stream is present, then the non-condensables will be sent to the vent. If the vent is not present, then all contents will be sent to the product stream. If non-condensables are present in the feed, the Saturation Temperature changes as vapour is condensed. For simple methods where the user sets the amount of condensation, the outlet temperature is set to SatT@PP in the feed stream. For duty methods, the outlet temperature is set such that the relative humidity of the gas stream is 100% (=SatT@PP in outlet stream). For the Product Temperature method, the outlet temperature is set by the user and the model adjusts the amount of condensation so that the relative humidity of the gas stream is 100% (=SatT@PP in outlet stream). For the Bypass to Vent method, the condensate temperature is set to SatT@PP in the feed stream and the temperature of the Vent stream is determined by energy balance. For the duty methods with no demand connection (manual), the user specified duty may not match the condensing duty (based on fully condensing of the feed condensing species). If it is less, then condensation will be partial. If it is too much, then subcooling of the condensate can occur. When a vent is connected, in most circumstances, the vent and product streams will be at the same temperature. The exception is if the Bypass to Vent method is used. In this case, the vent stream is likely to be hotter than the product stream. NOTE: Condensable refers to the condensing species, set in the VLE tab. Non-condensables refers to all other vapours. For example: if the vapour mixture contains combination of H2O(g) and NH3(g), and the condensing species is set to H2O(g), then H2O(g) will be condensed, while NH3(g) will be treated as a non-condensable and will be sent to the vent (if present). SimpleCondenser tab - This first tab contains general information relating to the unit. VLE - Allows the user to set the evaporation component. QFeed - Optional tab, only visible if ShowQFeed is enabled. This page shows the properties of the feed to the unit after the EntryDP has been applied. HXCalc tab - This second optional tab allows the user to set / calculate design data for the unit based on the actual duty. Info tab - Contains general settings for the unit and allows the user to include documentation about the unit and create Hyperlinks to external documents. Links tab, contains a summary table for all the input and output streams. Audit tab - Contains summary information required for Mass and Energy balance. See Model Examples for enthalpy calculation Examples. Unit Type: SimpleCondenser - The first tab page in the access window will have this name. On Tick Box If this option is deselected, the Simple Condenser will not be operational and thus inlet conditions = outlet conditions. CondensingMethod / Method Fixed Duty This allows the user to specify the Simple Condenser duty. This method is designed to work in the demand mode, where the input vapour rate can be varied based on the specified duty and the condensing species in the feed will be fully condensed. If the demand connection is set to Manual, then the required duty may not be equal to the fully condensing duty and partial condensation or subcooling of the condensate may result. Duty Tag Same as Fixed Duty except the Duty is specified by a tag. Product Temperature This allows the user to specify the desired product temperature. Depending on the Saturation Temperature of the feed, there may only be cooling without condensation, condensation at the saturation temperature or complete condensation with subcooling of the condensate. Saturated T The product temperature will be equal to the saturation temperature for the condensing species (component selected on the VLE tab page). No condensation will occur. Condense All The condensing species in the feed will be fully condensed. Mass Condensed The user specifies the (maximum) mass of the condensing species to be condensed. Mass Condensed Tag Same as Mass Condensed except the mass is specified by a tag. Fraction Condensed The user specifies the fraction of the condensing species to be condensed. Bypass to Vent Only available if a vent is connected. The user specifies a desired relative humidity in the vent stream. A portion of the feed will be bypassed to the vent to achieve this with the remainder of the condensing species being fully condensed. DutyReqd Input This field is only visible if Method = Fixed Duty. The required duty. If the specified Duty is too low or too high (compared to fully condensing duty), then partial condensation or subcooling of the condensate may result. DutyTag Input This field is only visible if Method = Duty Tag. This allows the user to set the duty tag from another unit or from a side calculation. DutyReqd.Meas Calc This field is only visible if Method = Duty Tag. It displays the actual duty value being used from the linked tag. DutyFactor Input This field is only visible if Method = Duty Tag. The duty factor. For example: If the duty being linked is -ve, using -1 to change the duty to +ve. MaxSubCoolDT Input This field is only visible if Method = Fixed Duty or Duty Tag and DemandConnection = None (Manual). The degrees of subcooling allowed below the saturation temperature if the duty specified exceeds what is required for full condensation of the condensing species. (only visible for Duty Methods) None (Manual) The input to the condenser is manually specified by the user. General Demand The steam supply comes from (directly or indirectly) a Feeder with Demand.on selected. Flash Train Demand The steam supply comes from another unit such as Flash Tank. The Flash Tank - Simple Condenser will form a Flash train where the amount of flashed vapour will be varied to meet the condenser duty. ProductTReqd / T_Reqd Input This field is only visible if Method = Product Temperature. The required temperature of the product stream/s. Condensation will not occur if the product temperature is above the saturation temperature of the feed. CondReqd Input This field is only visible if Method = Mass Condensed. The required mass of the condensing species to be condensed. This will not be achieved if there is insufficient mass of the condensing species in the feed. CondTag Input This field is only visible if Method = Mass Condensed Tag. This allows the user to set the mass condensed tag from another unit or from a side calculation. CondReqd.Meas Calc This field is only visible if Method = Mass Condensed Tag. It displays the actual mass condensed value being used from the linked tag. CondFactor Input This field is only visible if Method = Mass Condensed Tag. The condensation factor. For example: If the mass flow being linked is -ve, using -1 to change the mass flow to +ve. FractionReqd Input This field is only visible if Method = Fraction Condensed. The required fraction of the condensing species to be condensed. This section is only shown if Method = Bypass to Vent. VentRelativeHumidity / Vent_Rh Input The vent relative humidity requirements. The fraction of feed that bypasses directly to the Vent stream is varied to try to achieve this. EntryPressureLoss / EntryDP Input The entry pressure loss required. The condenser unit will fully condense the condensing species to the saturation temperature based on the partial pressure, so inlet pressure and entry pressure loss of the feed is important and the user should make sure the pressure is set correctly. HXSizeCalc Tick Box This option will add the HXCalc tab for calculations of 1) Area 2) heat transfer coefficient (HTC) or 3) log mean temperature difference (LMTD) based on the actual duty of the Simple Condenser. TrackFlashSpFeed Tick Box Option to enable warnings if feed to unit contains solid or liquid species apart from the condensed species. ShowQFeed Tick Box QFeed and associated tab pages (eg Sp) will become visible if this is enabled. These tabs will show the properties of the feed stream to the Unit after the pressure change. HeatFlow Calc The heat flow to the condenser. This would usually be -ve, indicating that heat has been removed to cause condensation to occur. MassFlow / Qm Calc The mass flow going through the condenser. FracCondensed Calc The fraction of the condensing species in the feed that has been condensed. VapourFracIn / Vfi Calc The feed vapour fraction based on total stream. FlashSpInVapour /FlashSpFrac Calc The feed vapour fraction of the flashed species based on total vapour. For example, if feed stream contains a mixture of H2O(g) and N2(g), and the flash species is H2O(g). Then the FlashSpFrac = H2O(g) / (H2O(g) + N2(g)) * 100. PressureIn / Pi Calc The combined feed pressure. PressureOut / Po Calc The product stream pressure. PressChange / dP Calc The change in pressure. This is set by EntryDP. Vent.Temperature / Vent.T Calc Only shown if a vent stream is connected. The vent stream temperature. The vent will be leaving the unit at the combined Feed Temperature, not the condensate temperature. Vent.Pressure/ Vent.P Calc Only shown if a vent stream is connected. The vent stream pressure. Duty.Condensing Calc The condensing Duty of the Simple Condenser. This is the duty from fully condensing all of feed condensing species. Duty.Actual Calc The actual Duty of the Simple Condenser. The following fields are only visible if Method = Fixed Duty or Duty Tag. Duty.Reqd Calc The user specified Duty for the Simple Condenser. Duty.Error Calc The absolute difference between the Required Duty and the Actual Duty. Duty.RelErr Calc The relative difference between the Required Duty and the Actual Duty. VapourFlow.Actual Calc The total actual vapour flow to the condenser. VapourFlow.Error Calc The absolute difference between the Total and Actual vapour flow. This will warn the user if the amount of steam supplied does not equal to the condenser duty requirements. Most common when the condenser is not in demand mode and the steam flow has not been set up to auto adjust. VapourFlow.RelErr Calc The relative difference between the Total and Actual vapour flow. This will warn the user if the amount of steam supplied does not equal to the condenser duty requirements. Most common when the condenser is not in demand mode and the steam flow has not been set up to auto adjust. Note: Extra fields are visible if the unit is part of a Flash Train. These fields are described below. Please refer to Flash Train. VapourMassFlowReqd / VQmReqd Calc The calculated mass flow of steam required by the condenser. CondMassFlow / CondQm Calc The amount of steam condensed by the condenser. MinSatPress Calc The minimum saturated pressure of steam that could satisfy the heat requirements on the condenser. FlashTrain Display A unique tag assigned to the flash train by SysCAD. Each unit in the flash train will have the same tag in this block. FlashTearBlock Display Displays the name of the tear block that is part of the Flash Train. Condensed.Reqd Calc The required amount of material to be condensed. This is the calculated amount based on the user specified mass condensed, mass condensed tag or user specified fraction condensed. Condensed.Actual Calc The actual amount of material condensed. Condensed.Error Calc The absolute difference between the Required and Actual amount of material condensed. This will warn the user if the amount of condensing species in the feed is less than the user specified mass condensed. Condensed.RelErr Calc The relative difference between the Required and Actual amount of material condensed. This page is only visible if the HXSizeCalc option is ticked on the first tab page. ModelDuty Calc This is the actual duty for the simple Condenser (thus duty calculated in the first tab page). It is used for all calculations. CalculateWhat HTC This allows the user to calculate the required HTC based on Actual Condenser Duty and specifying Area and LMTD. Area This allows the user to calculate the required Area based on Actual Condenser Duty and specifying HTC and LMTD. LMTD This allows the user to calculate the required LMTD based on Actual Condenser Duty and specifying HTC and Area. HTC Input/Calc Heat Transfer Coefficient - This field can be an input or a calculated variable depending on the method selected. Area Input/Calc Heat Transfer Area - This field can be an input or a calculated variable depending on the method selected. LMTD Input/Calc Log Mean Temperature Difference - This field can be an input or a calculated variable depending on the method selected. Sort either by DLL or Group. See Project Configuration for more information on adding models to the configuration file. See Insert Unit for general information on inserting units. This page was last edited on 14 January 2019, at 19:07.